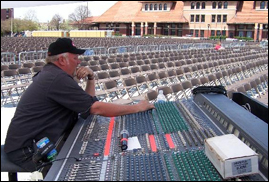 JACKSONVILLE, FL (CelebrityAccess) — Veteran live event production specialist Mike Mason of Mason Sound died unexpectedly of complications from an unspecified medical condition. Mike Mason and Mason Sound have been providing production support and equipment rentals in the Jacksonville market for more than two decades. "Mike was a true professional in every aspect and a great human being. His kind heart and understanding of the "industry" always made Mike a true pleasure to work with. You will be missed deeply; Rest In Peace my friend," wrote colleague Warren D. Jones of the Artists Entertainment Network.